Tradition, Tradition, Tradition!!!! Remember that famous song from the Broadway musical, Fiddler on The Roof? We can’t seem to escape from these customs that mark the passing of time with habitually repeated events laden with a sense of meaning associated with them. This is the case when the warm weather comes around between my close-set of friends and me. It usually spells time to head to the beach, specifically Rehoboth Beach, DE. Having already gone there as a group for nearly 15 years, we have developed certain traditions: hearty breakfasts consisting of bacon, sausage, tarragon omelet, and toast with local fruit jams; grilled steaks and local sweet corn for dinner; a day (ok, a couple) at the Outlet Malls (tax-free); hanging out at Poodle Beach (end of the boardwalk) in the afternoons until the rented umbrellas are removed; and stopping by Jimmy’s Grill on the way back to DC/MD on a Sunday afternoon. 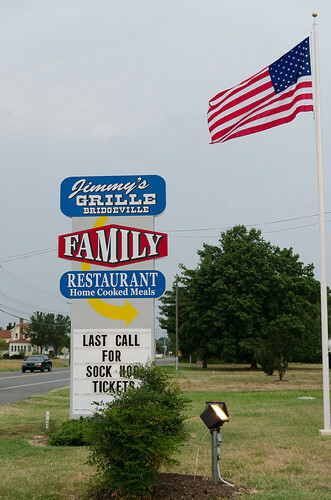 Jimmy’s Grill is located within the limits of the quiet and quaint town of Bridgeville, DE, on the Business Route 404 corridor that used to serve as the main thoroughfare to Rehoboth from DC Metro – there is now a bypass around the town infamous for its 25 mph speed traps. I remember stopping there for the first time years ago. It had a homey feel to the place, but unfortunately, they closed by 6 p.m. on a Sunday and they did not take credit cards then – I had to time my departure from the beach to make it there on time. But 6 years ago they were bought over by the employees (from what I heard), and the place went through some redecorating while maintaining its charm, along with longer hours and the acceptance of credit cards. One thing that has not suffered any change has been the quality of the food and the prices. Walking into the establishment, you immediately get a sense of home comfort and of local community. Plastered in the vestibule are photos of local folks posing with the owners. Passing through it you are immediately assaulted by a huge cake display tower that would make your eyes bug out from the equally towering home-made cakes that scream “leave some room for me too.” The place is usually filled with a combination of local folks and visiting beach travellers, usually repeat customers. There is nothing fancy about the decor with a few vintage movie posters above the simple banquets or cafeteria-like tables and chairs. But this is not why we, as well as the other diners, are here for. Can I have the menu, please? Tradition! Fried Chicken! This place is known for this quintessential comfort food that is so straight forward and not fussy at all. That is the only dish I order here because it is that good and I don’t have it anywhere else – where else would serve lots of chicken but in this area renown for the chicken farms that dot the highway. I usually get a piece of moist breast that is well-seasoned throughout the meat (not just the topping) with a crispy, equally seasoned and not overly thick batter. Diet out of the window, I would dig into this extremely irresistible morsel with no guilt, shame or remorse, but with a few dashes of hot sauce. Need I say more? The proof is the in the greasy fingers and meat-strippen bones left on the plate. Tradition! The side dishes! These small dishes are the equal stars in this eatery that sometimes attempt to steal the limelight from the mains. 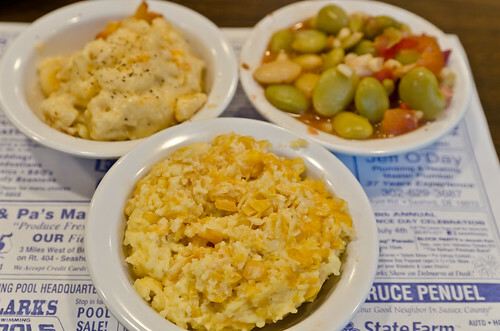 My favorites are usually the Corn Pudding, Collard Greens, and Lima Beans. The corn pudding is studded with fresh kernel of local corns (corn country here also), slightly sweet, slightly eggy, and quite light for this bowl of rich deliciousness – a must-order for me, always! The collard greens are de rigueur for me as well for its long cooking, delicate seasoning, and the lack of any meat fat in the stock, which I appreciate – a couple of dashes of hot sauce on it and it’s gone. An order of Lima Beans were smooth, silky, not grainy, with bits of tomato that provided some sweet acidity to the starch. I nearly forgot the Scalloped Potatoes that are thinly sliced potatoes covered by a cheesy sauce that make them irresistible and calorie-amnesia producing. Other sides ordered by my buddies included cucumber salad and macaroni and cheese, which seem equally tasty judging by the empty bowls. At times, they offer the local corn-on-the-cob as their special – if you are not corned out by now, you should try it. I could eat just order an array of their sides as my meal and I would be in heaven. The eatery has daily specials that cater to the traveller as well as the locals. Usually on Sundays, there is Prime Rib or Chicken with Slip Dumplings. On this given day, Rockfish stuffed with Crabmeat was on the menu, which was ordered by my bestie’s bf. 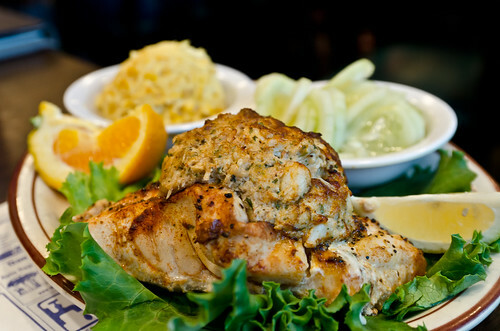 A large fillet of the local fish had a mound of lump crabmeat stuffing perched on top. This man tore into his meal like he had never eaten before, and judging by his closed eyes and slow side shaking of his head, I knew it was good – pity I didn’t get to savor a single morsel. Another buddy was so taken by this man’s foodgasm that he had to place an order to go (“Can I have what s/he is having.”). He later reported that is was very good but a little dry, perhaps due to the travelling. Next time, I will place on order especially all that seafood for $14. Another friend’s order of Chicken with Stuffing was tasty and very homey, with chicken breast stuffed with bread stuffing, coated with a thick gravy – it tasted like what a good home cook would serve to her hungry loved ones. OK, let’s cut to the chase and Let’s Eat Cake! 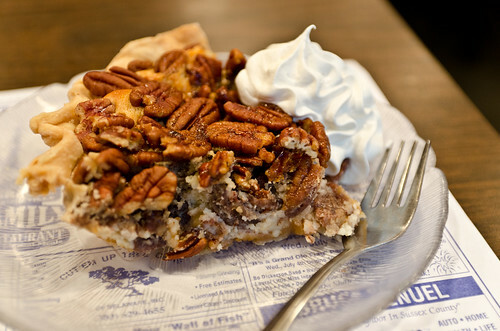 The Rockfish Devourer’s order of Pecan Pie arrived first. But before he could take his first bite, I had to take a picture of it. And did I get a good stare from this famished man until I finished taking the singular shot, even though he had already polished the fish in no time. Again, he had foodgasm, and he even picked it up with a mound of whip cream and ate it like a cookie – it must have been that good! My bestie took out an order of Banana Cake. 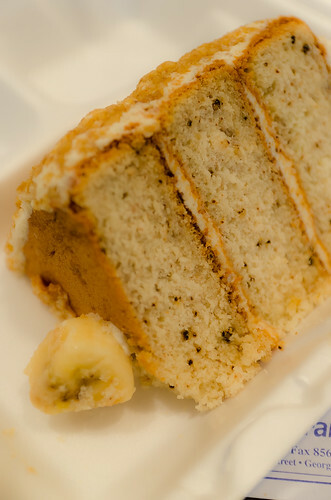 I tried a forkful and I was amazed by the lightness and moistness of the cake that was filled with banana flavor, small pieces of walnut, and hint of vanilla, all not being too sweet. I could have eaten the whole huge slice even though if I were full, but I would get evil-eyes from him. Another take-out order of Coconut Cake for another friend proved to be equally delectable and successful as the above concoction with a light moist vanilla cake coated with sweet frosting and sweet coconut. Let them eat cake, as well as us! 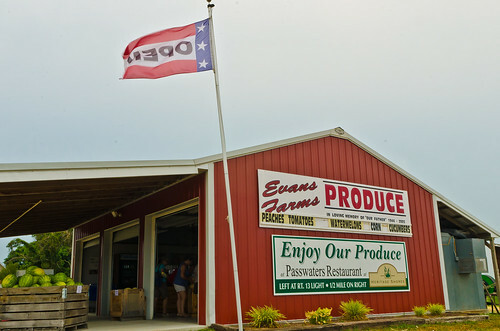 A new tradition: Last year I stopped by a roadside stand, Evan’s Farm Produce, on the same highway not too far from Jimmy’s Grill, and I bought some local corn as well as a jar of their home-made orange marmalade. Tasting the marmalade at home, I was delighted by the not overly sweet jam, the soft bits of orange rind that exuded a slight bitterness, and the slight acidity from the use of orange juice as the jam. I literally fell in love with this sweet bitter preserve, and I was sad when I ran out of it a couple of months later. So, on my way back to the beach last week, I stopped by the stand and bought 3 bottles in addition to a recommendation, Triple Crown Preserves, consisting of Strawberries, Red Raspberries, and Cherries. Wow! My friends loved this berry-packed jam so much that they finished off half a bottle in a single weekend, and I bought another bottle on my way home, just before stuffing my face at Jimmy’s. Lookout for this fantastic stand just when the Bridgeville bypass merges with Route 404 heading eastward to the beach. 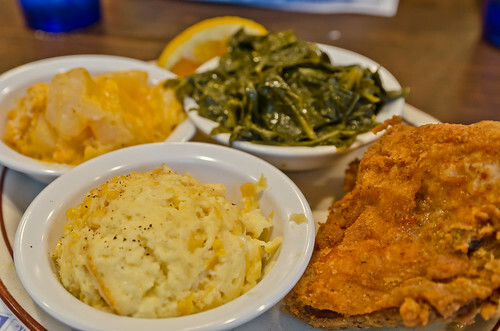 So, on your way to Rehoboth Beach, make sure to look out for Jimmy’s Grill for its wonderful home-style cooking, especially the fried chicken and the wonderful side dishes. 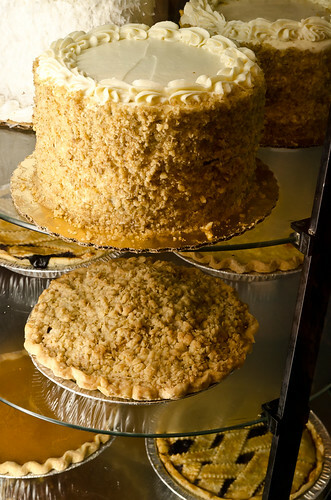 Oh, also don’t forget to take home a huge slice of cake and pie. 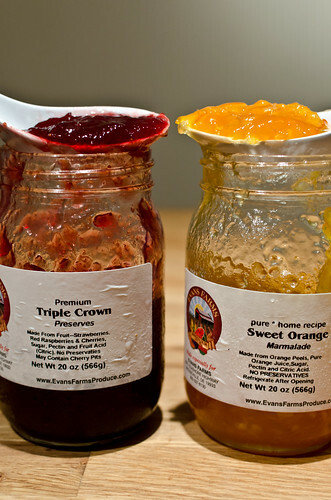 Also, make it a point to stop by Evan’s Farm Produce stand just a mile down the road to stock up on some local corn, orange marmalade, and Triple Crown jam. After sampling the food and goods from these two establishments, they may become new traditions for you and on your beach travels. Happy Summer and Safe Travels!